King's Stables, Old town, 40 Saborna Str. 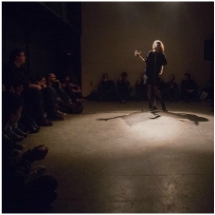 The film program of "Night is Cinema", held for the first time in NIGHT/Plovdiv, is conditionally divided into short films by the American Film Institute, experimental cinema and films with content for mature audiences. I believe the individual segments in a peculiar way summarize our lives – mainstream and popular, elitist and more difficult to communicate and hidden, sometimes even cynical ... The "Night is Cinema." Maya Vitkova is a writer-director and producer born in Sofia in 1978. She graduated from the National Academy for Theatre and Film Arts in 2001. Between 1996 and 2008, Maya has worked as an assistant director and executive producer for national and international productions, such as the BBC’s Eastern Delight by Michael Palin and National Geographic’s The Ancient X-Files. In 2008 she executive produced Kamen Kalev's Eastern Plays, which premiered at the Cannes Directors' Fortnight. In 2009 Maya founded Viktoria Films, producing two shorts written by the Romanian Radu Jude, and her debut feature Viktoria. The film premiered at the Sundance Film Festival in January 2014. Viktoria has been the first Bulgarian feature in competition at Sundance, Rotterdam, the American Film Institute’s AFI Fest and many others in 2014/2015. Viktoria had more than 70 international selections, 10 awards and is the second Bulgarian feature sold for distribution in the USA. 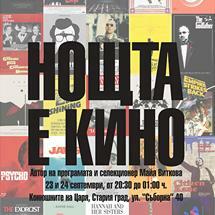 Supported by the Embassy of the USA - Bulgaria.